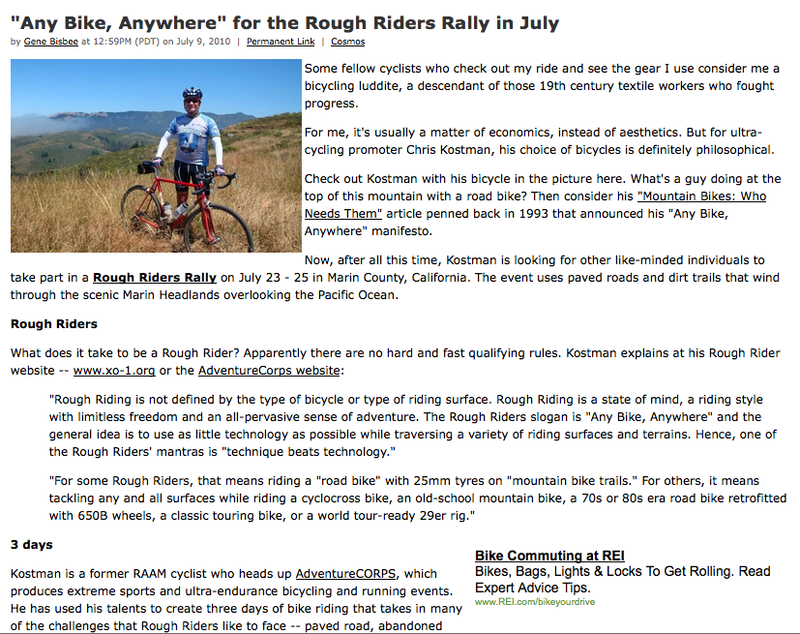 Special thanks to Gene Bisbee for featuring Rough Riding, and the Rough Riders Rally in particular, on his outstanding cycling blog, BikingBis.com. 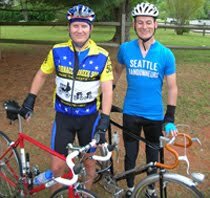 I visit his site daily, thanks to his wide-ranging coverage of everything from the latest TdF updates to bicycle touring to legal issues, and much more. Gene really runs the gamut with his blogging and I read everything he writes. Click on over to read his post from today about our movement! 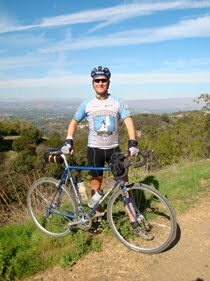 Some fellow cyclists who check out my ride and see the gear I use consider me a bicycling luddite, a descendant of those 19th century textile workers who fought progress. For me, it's usually a matter of economics, instead of aesthetics. 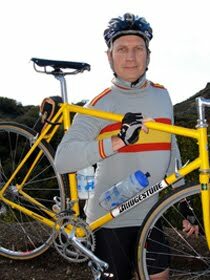 But for ultra-cycling promoter Chris Kostman, his choice of bicycles is definitely philosophical. 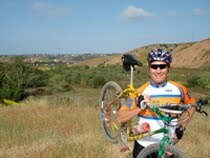 Check out Kostman with his bicycle in the picture here. What's a guy doing at the top of this mountain with a road bike? 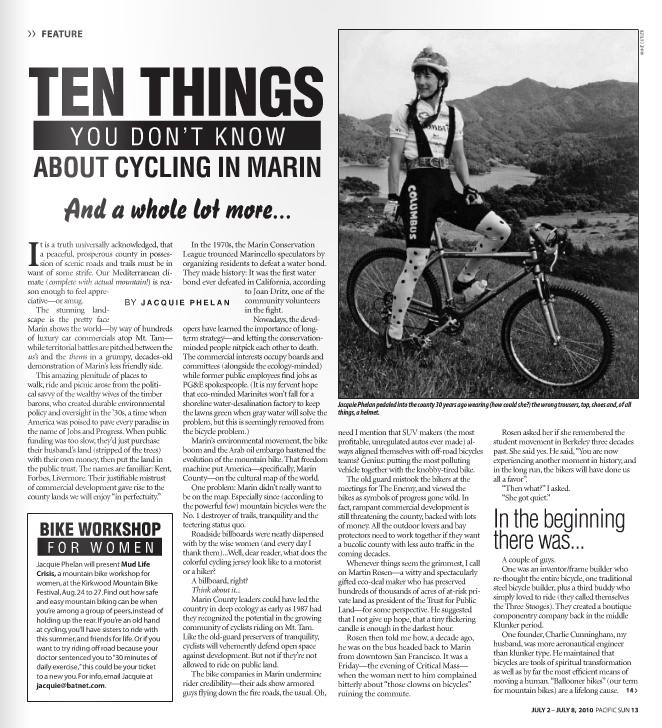 Then consider his "Mountain Bikes: Who Needs Them" article penned back in 1993 that announced his "Any Bike, Anywhere" manifesto. 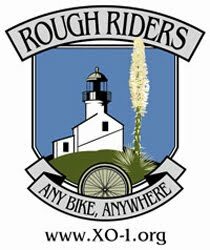 Now, after all this time, Kostman is looking for other like-minded individuals to take part in a Rough Riders Rally on July 23 - 25 in Marin County, California. 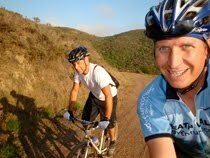 The event uses paved roads and dirt trails that wind through the scenic Marin Headlands overlooking the Pacific Ocean. 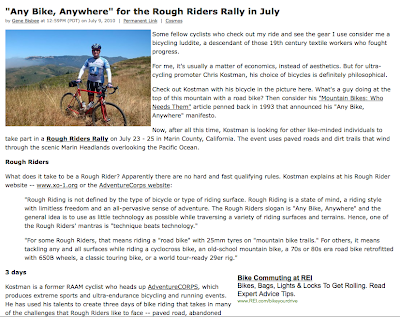 "Rough Riding is not defined by the type of bicycle or type of riding surface. Rough Riding is a state of mind, a riding style with limitless freedom and an all-pervasive sense of adventure. 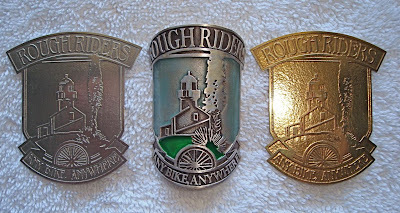 The Rough Riders slogan is "Any Bike, Anywhere" and the general idea is to use as little technology as possible while traversing a variety of riding surfaces and terrains. Hence, one of the Rough Riders' mantras is "technique beats technology." 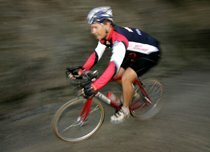 "For some Rough Riders, that means riding a "road bike" with 25mm tyres on "mountain bike trails." For others, it means tackling any and all surfaces while riding a cyclocross bike, an old-school mountain bike, a 70s or 80s era road bike retrofitted with 650B wheels, a classic touring bike, or a world tour-ready 29er rig." 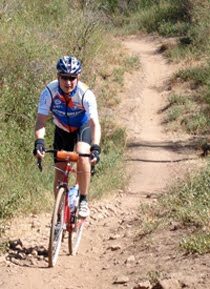 Kostman is a former RAAM cyclist who heads up AdventureCORPS, which produces extreme sports and ultra-endurance bicycling and running events. 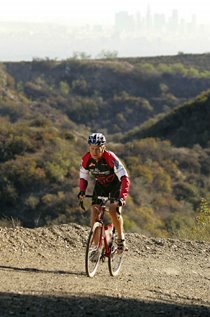 He has used his talents to create three days of bike riding that takes in many of the challenges that Rough Riders like to face -- paved road, abandoned pavement, fire roads, dirt trails and single track. 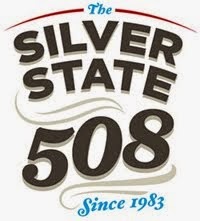 Day 2 of the rally, for instance, features a 36.5-mile ride over all those conditions and 5,700 feet of elevation gain. The route intersects the Mill Valley to Stinson Beach "Dipsea" running route and boasts view of Mount Tamalpais and (on a fogless day) views of the Golden Gate Bridge. You can see write-ups on his three-day recon of all the stages at "Rough Riders Rally, Final Recon of all Routes." Kostman shares pictures and descriptions of hte routes, as well as suggestions on how much of the route is passable on different width tires. Kostman recently got word that Marin bike racing legend Jacquie Phelan will be joining the Rough Riders Rally. You can read more about her achievements and exploits at Rough Riders website. 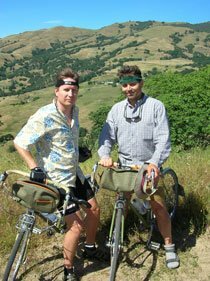 Other participants include bicycling author Owen Mulholland and "co-creator" of the sport of mountain-biking, Charlie Kelley. If you're thinking of signing up for this event, do it soon. Registration closes on July 16 or with 100 participants, whichever comes first. 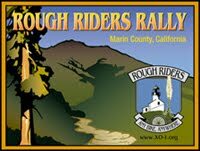 Here's the Rough Riders Rally registration page with all the details. 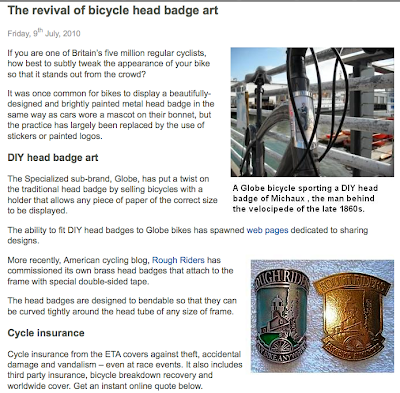 Click on over here to read and see the full story about the revival of bicycle head badges, including our very own Rough Riders head badges! Click here for our previous post about them. Jacquie "Alice B. Toeclips" Phelan was the NORBA Champion three consecutive years - 1983, 1984, and 1985. She is married to inventor Charlie Cunningham, the pioneering bicycle framebuilder whose aluminum bikes and patented brakes allowed Phelan to race unbeaten for six years. Her bike, "Otto" was raced nine consecutive seasons, a testimony to the durability of the heat treated framesets that drew criticism from traditional framebuilders who held that only "steel is real". 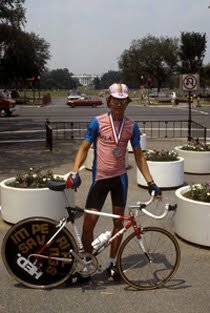 (She is a) charter inductee, with Cunningham, to the Mountain Bike Hall of Fame in 1988 and (in) 2000 (was) inducted into the United States Bicycling Hall of Fame. 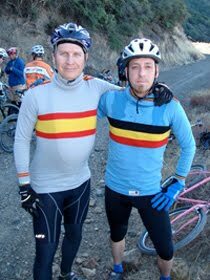 Along with a dozen others, Phelan co-founded NORBA in 1982, and was a charter member of IMBA. Phelan founded the Women's Mountain Bike & Tea Society. (WOMBATS) in 1987 to encourage women and girl's participation, and produced the sport's earliest skills camps, dubbed Fat Tire Finishing School. In this corner, hailing from Fairfax California, Jacquie Phelan, fifty four years old, a hundred and forty five pounds. Phelan--also known as "Alice B. Toeclips" -- frittered away her youth racing bicycles. "Eat Dessert First" is a cherished motto, along with "Ready, Fire, Aim!" As the eldest of six, she'd had a snootful of responsibility to last a lifetime. At twenty five she began the lifelong task of letting her parents down. By racing, writing and forgetting to have children, she's managed to craft a curiously stress-free life despite a virulent allergy to employment. The lone racing woman in a field of fellows, she confabbed a feminist conspiracy to de-program suburban mommy-chauffeurs. Many other women's groups achieve the same objective these days to her great delight, but the Women's Mountain Bike & Tea Society was the earliest attempt to show how incredibly safe, fun and easy offroad cycling is, if you ignore the ads. Phelan uses the third person a lot, being queen and all. 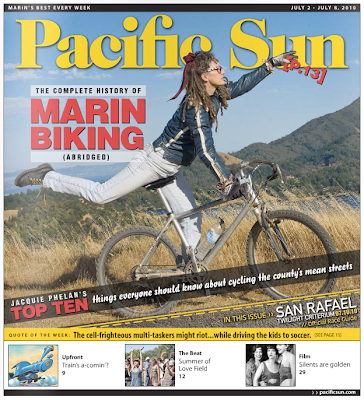 This article is a MUST-READ, so for Jacquie's full Pacific Sun story, click here and click to Page 12, OR click here for an html version of the same fascinating article. For Jacquie's blog, click here. Welcome to the Rough Riders Rally! 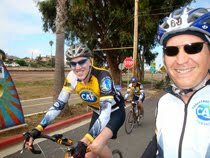 We're excited to ride and socialize with you! Click here for all the info, and to register! We have recently connected with a man named Terry Jones who makes a special kind of bicycle head badge. They attach to the frame with special, thin, ultra-strong, two-sided tape. The head badges are bendable, so can be curved tightly around the head tube of any sized frame. 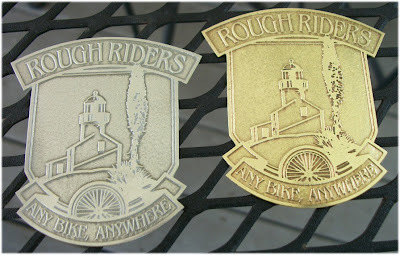 See above and below for the silver and brass versions of the head badges with the Rough Riders logo which he just made for us. In the shot below, they are sandwiched around one of the head badges we had made back in November of 2008, for point of comparison. Those were beautiful, but cost $100 each, had to be built for a specific head tube size, and took quite a while to get. They are also "heavy." But beauty is in the eye of the beholder and it's also nice to have two different price points. If you'd like to order one of this new style (which is also "ultra light" - smirk), let us know by Wednesday, July 7. Cost is just $40 for the brass or $45 for the silver ($10 discount is offered to Rough Riders Rally participants). Once we confirm your order, you can mail us a check or pay via Paypal. Contact us via adventurecorps at gmail dot com. Details: 2&1/4" tall and 1&5/8" wide. The badges are made from .015 brass and are ridged to hold a shape but flexible enough to be done by hand. PS Just watched the TdF Prologue. Yeah Lance! Photo above of the author (L) and Sky Boyer by Dustin Sharp. The best way to start a ride, or conduct any aerobic activity, is to warm up properly. “Warming up” is not just about elevating heart rate, however; it’s also about gradually warming up the entire body and bringing one’s attention to the matter at hand. This takes time to do it properly. 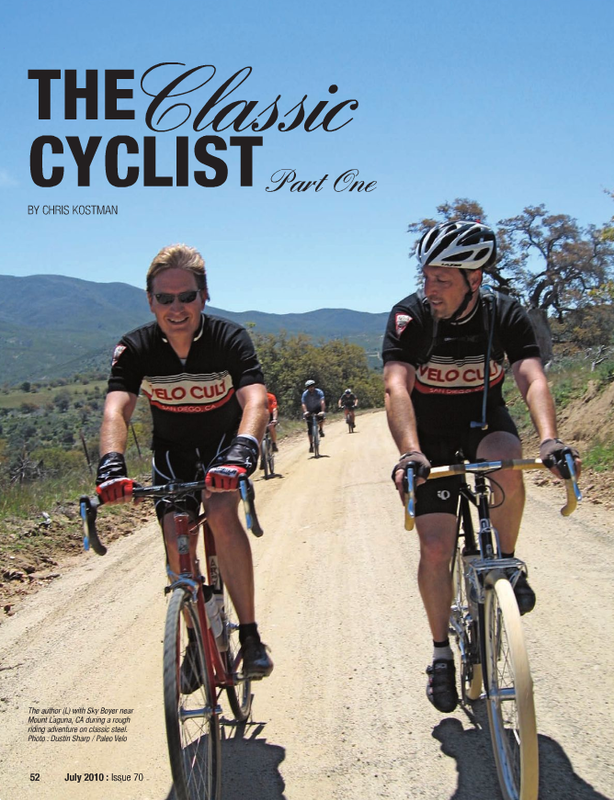 A classic cyclist will take the first ten to twenty miles of a ride, or even a race, to warm up properly, usually staying off the big chainring and two smallest cogs. 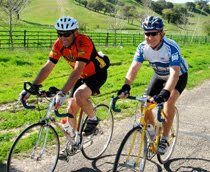 As a result, he or she will actually ride better and more quickly than the current jackrabbit style of cyclists who catapult onto every training ride or event. 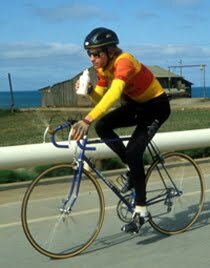 Frankly, it’s shocking to me that riders today just take off “like a bat out of hell” even on a training ride, or social ride. 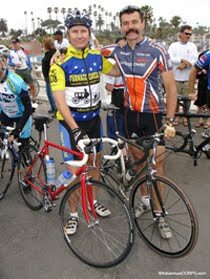 Back in the day, at a double century or a road race, riders would all cruise together for the first hour or more, socializing while warming up properly. They’d end up becoming fitter, setting faster PRs than riders today in the same events, getting to know one another better, AND having more fun.